At Alsicare we understand the physical demands of being a carer which is exactly why we designed workwear with you in mind. Carer uniforms need to allow freedom of movement and be comfortable to wear. Ours are also hard wearing because our carers’ uniforms are made from polyester/cotton fabrics developed to withstand repeated washing and wear. This is exactly why we have designed and patented our range of A-Move Tunics. A-Move is a genuine innovation in carer’s tunics allowing you freedom of movement and at the same time keeping you cool. A-Move Tunics allow lifting, stretching and bending movements with ease. 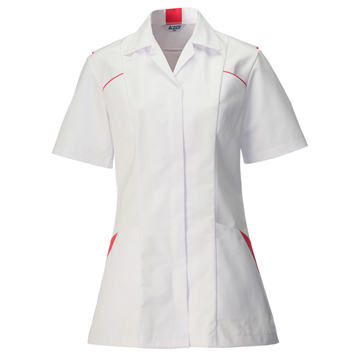 Our Nurses Tunics are available singly or bulk buy packs. Female A-Frame Tunics are white with contrasting trim available in a wide range of colours including Jade, Burgundy, Pink and White. A Saver Pack of 4 Female A-Frame Tunics is also available in Pink with packs of mixed sizes available at no extra cost! So what’s special about our A-Move tunics? Well everything. To keep you comfortable open arm hole-vents and internal mesh for ease of movement. And as you’d expect for a premium tunic they have a four piece back with yoke, 2 lower hip front pockets and 2 breast pockets. There’s even a special pen pocket. Sizes range from 8 to 28. A-Move tunics are also available for men. 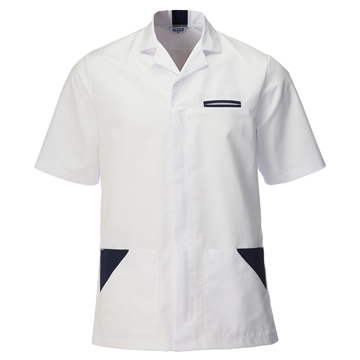 Nurses Tunics Male A-Move / Pack of 4 Make A-Frame offer identical superior comfort and are available in sizes 36 through 48. Your choice of logo or name can be added to any A-Move tunic. Just upload your artwork when ordering. We also offer wide a wide range of Female Tunics in solid colours such as Female Tunic – Sailor Navy and Female Tunic – Mint, although other colours are available. All our solid colour tunics have contrast piping and are available in sizes 8 to 28. A Saver Pack of 10 White Tunics is available and a logo/name can be added. We also make a Male Tunic – White which is also available in Saver Pack of 10 Male Tunics – White. Sizes range from 36 to 54 and a logo can be added and there’s no extra charge for mixed sizes. Trousers are also available to team up with your choice of tunic. Our Female Bootleg Trouser – Navy comes in sizes 8 to 26 and is available in Regular and Tall. Our Mens Trouser One – Navy is available in sizes 30-42 and in Regular and Tall lengths. For men and women there are other styles to choose from too! Click here to see our full range of tunics.